Worm control in cattle has been challenging this summer due to the exceptionally dry weather and the emergence of ivermectin resistance. Farmers need to be aware that it is highly likely there will also be a sudden emergence of infective lungworm larvae that could cause outbreaks of hoose. Dectomax help manage and control the impact of worms on performance. 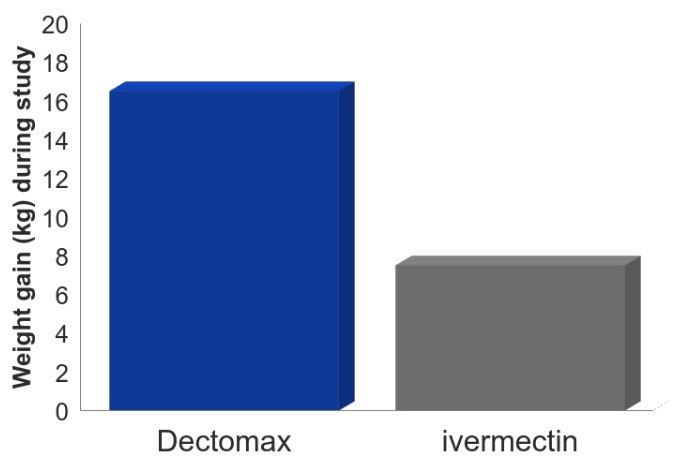 Dectomax is different than other wormers because it has 5 weeks persistent activity against Ostertagia and 6 weeks persistent activity against lungworm (Dictyocaulus vivparus) Dectomax Pour On contains 5mg/ml Doramectin and is available in 1ltr and 3ltr bottles. For the treatment of infestations of gastrointestinal roundworms, lungworms, eyeworms, warbles, sucking and biting lice, mange mites and horn fly in cattle. A single treatment of 1ml/10kg bodyweight, equivalent to 500μg/kg bodyweight, applied topically along the mid-line of the back in a narrow strip between the withers and tail head. Meat and offal: 35 days. Milk: Do not use this product in lactating cows used to produce milk for human consumption, or in dry cows or pregnant dairy heifers within 60 days prior to calving. Late summer and early autumn are the highest risk periods.